You leave the hot sun of Southern France, the hills now heavily forested and rolling into the distance, the nearby limestone cliffs and gorges, gouged by time and the Ardèche River. You step inside the Chauvet Cave, or rather its newly opened replica, 6 kilometers from the real one near the Pont d’Arc, adjust your eyes to the dark, your skin to the cool damp, and quickly know you have become a time-traveler. 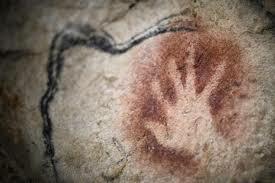 You have entered the world of Cro-Magnan man and the oldest-known example of cave art, dating back some 36,000 years. You are struck first by the sensation of it, the dimensions, the unfolding chambers defined by low ceilings and icy looking stalactites and stalagmites, which catch the cave light and glow with a shimmering beauty. Then there is the floor, its scattering of bones, many of them accumulated and piled together by the cave’s earliest inhabitants, cave bears, who also left many footprints and claw marks on the soft earth. Then you not only look up, to the walls, but you begin to see. They are suddenly alive with animals—huge, mostly predatory, dangerous animals—mammoths, lions, wooly rhinoceroses, reindeer, bison, ibexes, horses. From chamber to chamber you follow them, sometimes in single images; sometimes in pairs; sometimes copulating; sometimes fighting; sometimes in full gallop across the steppes which were then outside. 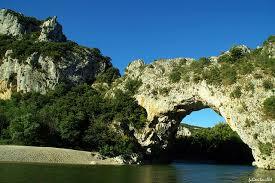 You will learn that the cave has 450 animal pictures showing 14 or perhaps 15 different species. You will learn a dizzying number of other facts, too, about paleontology, geology, speleology; about carbon dating, theories of evolution, and the family tree of early man. But you can’t, just yet, take them in because your eyes are still swimming with red dots, the burst of them like a balloon sellers’ display, which caught you near the entrance. And then you have seen it, the first hand outlined on the wall. It is the artist’s hand, a signature, a hand very like your own. It is followed by other, some full-on handprints colored red, some “negative” prints, done in outline. One artist, with a markedly crooked little finger, displays his—or is it her?—signature print in many places throughout the cave, making it possible to trace his/her work. 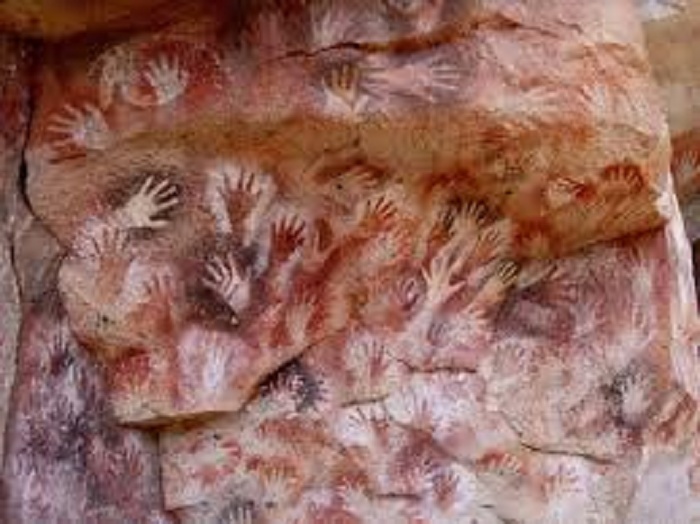 Then, many hands come together for a full–blown painting of handprints. The artistry is dazzling, the techniques amazing: the use of charcoal, and natural pigments, such as ochre; the artists’ ability to paint with brushes and fingers, to scratch images; their mastery of depth and dimension by incorporating rock surfaces into their work; their astonishing depiction of movement—like early cinema—by painting several “animals” side-by-side in motion, which, especially when viewed by torchlight, actually represent one animal running. Once you have seen this art up close for yourself, you will be eager to understand what it means. What was its intent? You will learn many theories, postulated by many experts. They run into each other with words like ritual, animal spirits, magic, shamanism. No doubt the words hold pieces of the truth, but no one can say for sure. That is also true for all art. You can become learned and informed and knowledgeable, but you can’t really know what it means, you can only feel it, in your heart, in your bones. 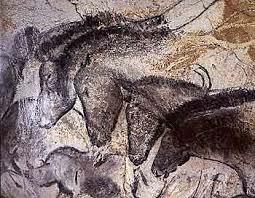 In 2010, Werner Herzog made a film entitled “Cave of the Forgotten Dreams,” about the Chauvet cave and its art, which was discovered in 1994 by Jean-Marie Chauvet. 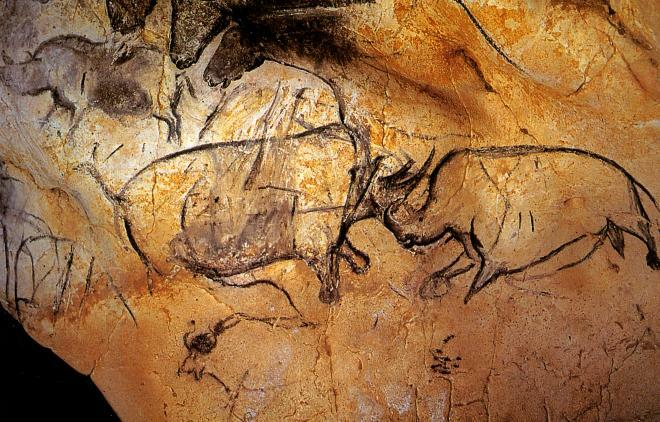 But the result of Chauvet’s spectacular find was to create the replica, which took dozens of experts and artisans, many years and 55 million Euros to make. So the dreams created in this cave were hardly forgotten; they were merely resting in their own dream state until the homo sapiens sapiens of your time—like yourself–could pick them up to stir inside the dream field where these Cro-Magnan mothers and fathers left them. Was that their intent? Before experiencing their art, that would have seemed a far-fetched question. But when you have felt its power, its connection to you– even though its world of steppes and wild beasts has long vanished—the millennia between their time and your own seem erased. Little as you may understand about who they were and how they lived, the one thing you know here is that this tribe of hunting and gathering artists is your tribe. They exist in you; they are you. This is what happens when you see great art. It makes you rethink everything.